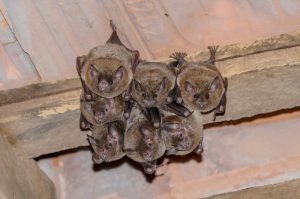 There are a few signs that are significant indicators that you have bats roosting in your home. Bats flying around your home during dawn or dusk hours. If you are dealing with bats, you may be wondering how they got into your home. After all, it’s not like you’re leaving your windows open in this heat. You may be surprised to learn that bats can squeeze their bodies through holes or cracks as small as a half-inch! These cracks, holes, or even vent openings, especially on two story homes, can be hard to detect. Bats are some of the most important creatures to our ecosystem. Alongside bees, they work to pollinate up to 60% of the produce in our diet. In addition to their pollination, they are also some of the best natural pest controllers out there, consuming up to 8000 insects in a single night. Because of this, there are restrictions on how you can handle bats. For instance, it is unlawful to purposefully harm or kill bats. If you suspect that there are bats in your home, it may be a good idea to get a professional out for an inspection. Luckily, Critter Control® of Miami has expert technicians trained in the best ways to handle a bat situation, so they can safely remove the animals and clean up after them. To get started today, give us a call at 305-258-3587.